This is a final project of two students on Cornell university. It is a single octave piano implemented on Atmega664 microcontroller. The interesting thing about this project is the keyboard made out of nothing but LEDs. 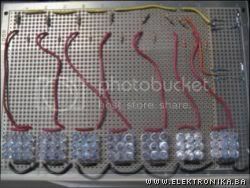 Each key consists of 9 LEDs where the middle LED acts as a light sensor. Remaining 8 LEDs are used to light up the fingers. When a finger (or another object) gets close enough, the light reflects from emitting LEDs to middle sensor-LED. The project source code is written in AVR GCC C and is available for download.